Whenever I am at home, I am wearing my slippers. Unlike when I was a kid and had slippers that looked like huskies and other things, they are nothing fancy other than a pair of leather slippers with wool on the inside which has largely worn away. 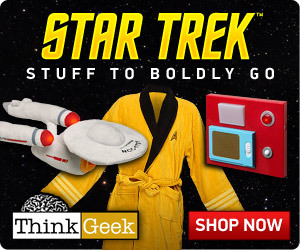 Well, if you are a Star Wars fan and are in need of some slippers like I am (actually I have one pair left like the ones I have now before I need a new one but they only last me about a year), then I have found the slippers for you! 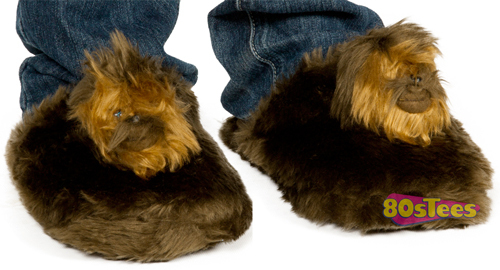 The awesome folks over at 80sTees are selling these Wookierific adult Chewbacca slippers for just $25. 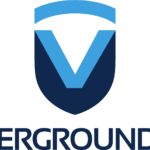 They are available in small and large depending on your shoe size (they have a size chart to tell you) and according to one of the reviews, they are very comfortable. If you are a big Chewbacca fan or know somebody who is that you are having trouble finding a Christmas present for, I suggest you order these awesome Chewbacca slippers! Some people aren’t huge fans of wearing slippers, but I love them. I always wear them around the house and sometimes I even wear them if I am too lazy to put on my normal shoes when I run out to grab dinner. There is a lot to be said for the comfort of slippers! Well, if you are also a lover of slippers and a big Star Wars fan, I have found the R2-D2 slippers for you! 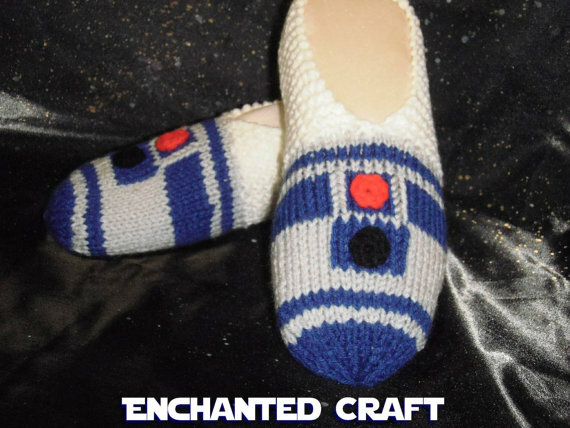 Etsy seller EnchantedCraft is selling these awesome hand-knitted R2-D2 slippers for just $30! This particular pair of slippers will fit a foot that is 7 1/2 inches long (un-stretched) to 10 inches long (stretched) which is basically a woman’s foot although men’s sizes can be made on request. Sounds like I might be getting a new pair of slippers soon (especially since my current pair is pretty much shot)!